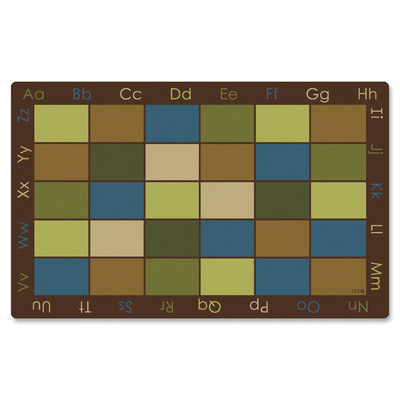 This Simple, Earth-Tone Rug Offers A Perfect Way To Enhance Classroom Organization. Each Colored Space Provides A Cozy Place For Children To Sit While Having Plenty Of Wiggle Room. Literacy Border Displays Both Uppercase And Lowercase Letters To Let Students Quickly Refer To The Letters Of The Alphabet.. This Simple, Earth-Tone Rug Offers A Perfect Way To Enhance Classroom Organization. Each Colored Space Provides A Cozy Place For Children To Sit While Having Plenty Of Wiggle Room. Literacy Border Displays Both Uppercase And Lowercase Letters To Let Students Quickly Refer To The Letters Of The Alphabet. Seat Size: 14" x 20"